Fast, dependable order fulfillment and shipping is critical to the success of your online business. And with eFulfillment Service (EFS), you can rest easy knowing that you’re working with a trusted, established partner. Our award-winning fulfillment center provides affordable storage, fulfillment and shipping services to online merchants of all types and sizes. Our top priority is getting your orders to your customers quickly, accurately, and to your specifications. Here’s an overview of our eCommerce shipping services and partners. As a leading eCommerce fulfillment center, we offer online sellers a range of shipping options to ensure you get the most reliable and cost-effective delivery method for your orders. Whether your customers require overnight delivery, or are satisfied with slower delivery in order to save on shipping costs, we offer an affordable, dependable solution. eCommerce sellers are able to take advantage of shipping partnerships we’ve established in order to save time, money, and to make their businesses more competitive online. A reliable, low-cost shipping service for your lightweight packages. A reliable, low-cost shipping service for your mid-weight packages. Ground delivery service for both lightweight and heavy packages. 2- or 3-day delivery service for both lightweight and heavy packages. Overnight delivery service for both lightweight and heavy packages. Our international fulfillment expertise makes it easy and affordable for you to reach new customers across the globe. We provide either an Export Declaration Form or a copy of your Export Commercial Invoice, depending on customs’ requirements. Upon delivery, any required duties are charged to your end customer. With eFulfillment Service, your orders go out the door quickly, and accurately. Expedited orders placed Monday thru Friday by 1:00pm EST will go out the door the same day. All other orders typically go out within one business day. 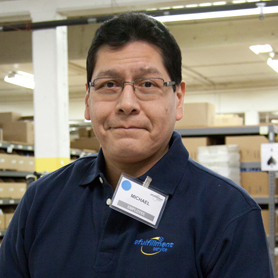 Once an order leaves our fulfillment center, we’ll email a ship confirmation to you. We also can email a ship confirmation, including a tracking number and your custom sales message, to your customer. In addition to email ship confirmations, we also make it easy for your customers to check tracking information on your website. We provide sellers with the option to add a button to their eCommerce stores, where your customers can view their current tracking information by entering one of following: name, email address, phone number, order number, or purchase order/reference number. If an order contains an out-of-stock item, the order is marked as backordered and held until the missing merchandise arrives at our fulfillment center. All Standard Ground, Expedited and Overnight product shipments include $100 damage or loss insurance coverage, and you can purchase additional insurance if you would like. We can collect C.O.D. amounts for Standard Ground, Expedited, and Overnight packages. Not only do our fulfillment services save you money on outbound shipping, we can also save you hundreds of dollars on inbound shipping. By sending your inventory to us via our preferred carrier, you will receive a freight discount of 70%, and our customer service team will work closely with you to set everything up. Get a free quote or call us at (866) 922-6783 to learn more about our inbound freight discounts and affordable fulfillment services.